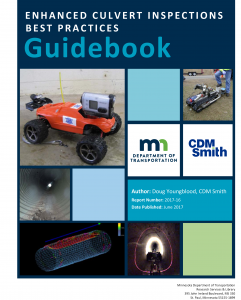 The guide describes traditional and enhanced inspection methods and tools, including the MnDOT-created Hydraulic Inspection Vehicle Explorer (HIVE). A simple end-of-pipe visual inspection of culverts may not provide enough detail to manage culverts efficiently. To help users obtain additional detailed data, many inspection technologies have been developed. Which technology is right for the job? A new manual from MnDOT provides guidance. The Enhanced Culvert Inspections Best Practices Guidebook is a primer on common culvert inspection technologies and applications. The manual summarizes the advantages and limitations of each technology and provides best practices when planning for and implementing an enhanced inspection project. The best practices in the document were developed based on a combination of industry standards and MnDOT practice. In addition, practical and logistic considerations are identified to assist staff in selecting cost-effective inspection methods for typical types of inspection.